This article is about the peninsula. For the administrative region, see Peloponnese (region). The Peloponnese (/ˈpɛləpəˌniːz/) or Peloponnesus (/ˌpɛləpəˈniːsəs/; Greek: Πελοπόννησος, Peloponnisos [peloˈponisos]) is a peninsula and geographic region in southern Greece. It is connected to the central part of the country by the Isthmus of Corinth land bridge which separates the Gulf of Corinth from the Saronic Gulf. During the late Middle Ages and the Ottoman era, the peninsula was known as the Morea (Greek: Μωρέας), a name still in colloquial use in its demotic form (Greek: Μωριάς). The peninsula is divided among three administrative regions: most belongs to the Peloponnese region, with smaller parts belonging to the West Greece and Attica regions. In 2016, Lonely Planet voted the Peloponnese the top spot of their Best in Europe list. The Corinth Canal separates the Peloponnese from mainland Greece. The Peloponnese is a peninsula that covers an area of some 21,549.6 square kilometres (8,320.3 sq mi) and constitutes the southernmost part of mainland Greece. While technically it may be considered an island since the construction of the Corinth Canal in 1893, like other peninsulas that have been separated from their mainland by man-made bodies of waters, it is rarely, if ever, referred to as an "island". It has two land connections with the rest of Greece, a natural one at the Isthmus of Corinth, and an artificial one by the Rio–Antirrio bridge (completed 2004). The peninsula has a mountainous interior and deeply indented coasts. The Peloponnese possesses four south-pointing peninsulas, the Messenian, the Mani, the Cape Malea (also known as Epidaurus Limera), and the Argolid in the far northeast of the Peloponnese. Mount Taygetus in the south is the highest mountain in the Peloponnese, at 2,407 metres (7,897 ft). Οther important mountains include Cyllene in the northeast (2,376 metres (7,795 ft)), Aroania in the north (2,355 metres (7,726 ft)), Erymanthos (2,224 metres (7,297 ft)) and Panachaikon in the northwest (1,926 metres (6,319 ft)), Mainalon in the center (1,981 metres (6,499 ft)), and Parnon in the southeast (1,935 metres (6,348 ft)). The entire peninsula is earthquake prone and has been the site of many earthquakes in the past. The longest river is the Alfeios in the west (110 km), followed by the Evrotas in the south (82 km), and also the Pineios, also in the west (70 km). Extensive lowlands are found only in the west, with the exception of the Evrotas valley in the south and in the Argolid in the northeast. The Peloponnese is home to numerous spectacular beaches, which are a major tourist draw. Two groups of islands lie off the Peloponnesian coast: the Argo-Saronic Islands to the east, and the Ionian to the west. The island of Kythira, off the Epidaurus Limera peninsula to the south of the Peloponnese, is considered to be part of the Ionian Islands. The island of Elafonisos used to be part of the peninsula but was separated following the major quake of 365 AD. 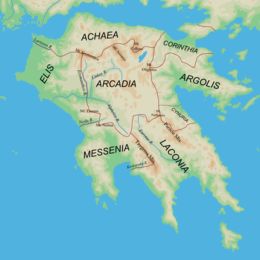 Since antiquity, and continuing to the present day, the Peloponnese has been divided into seven major regions: Achaea (north), Corinthia (northeast), Argolis (east), Arcadia (center), Laconia (southeast), Messenia (southwest), and Elis (west). Each of these regions is headed by a city. 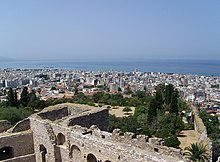 The largest city is Patras (pop. 170,000) in Achaia, followed by Kalamata (pop. 55,000) in Messenia. A map of the regions of the Peloponnese of classical antiquity. The Temple of Hera, Olympia. The peninsula has been inhabited since prehistoric times. Its modern name derives from ancient Greek mythology, specifically the legend of the hero Pelops, who was said to have conquered the entire region. The name Peloponnesos means "Island of Pelops". The Mycenaean civilization, mainland Greece's (and Europe's) first major civilization, dominated the Peloponnese in the Bronze Age from its stronghold at Mycenae in the north-east of the peninsula. The Mycenean civilization collapsed suddenly at the end of the 2nd millennium BC. Archeological research has found that many of its cities and palaces show signs of destruction. The subsequent period, known as the Greek Dark Ages, is marked by an absence of written records. In 776 BC, the first Olympic Games were held at Olympia, in the western Peloponnese and this date is sometimes used to denote the beginning of the classical period of Greek antiquity. During classical antiquity, the Peloponnese was at the heart of the affairs of ancient Greece, possessed some of its most powerful city-states, and was the location of some of its bloodiest battles. The major cities of Sparta, Corinth, Argos and Megalopolis were all located on the Peloponnese, and it was the homeland of the Peloponnesian League. Soldiers from the peninsula fought in the Persian Wars, and it was also the scene of the Peloponnesian War of 431–404 BC. The entire Peloponnese with the notable exception of Sparta joined Alexander's expedition against the Persian Empire. Along with the rest of Greece, the Peloponnese fell to the expanding Roman Republic in 146 BC, when the Romans razed the city of Corinth and massacred its inhabitants. The Romans created the province of Achaea comprising the Peloponnese and central Greece. During the Roman period, the peninsula remained prosperous but became a provincial backwater, relatively cut off from the affairs of the wider Roman world. After the partition of the Empire in 395, the Peloponnese became a part of the East Roman or Byzantine Empire. The devastation of Alaric's raid in 396–397 led to the construction of the Hexamilion wall across the Isthmus of Corinth. Through most of late antiquity, the peninsula retained its urbanized character: in the 6th century, Hierocles counted 26 cities in his Synecdemus. By the latter part of that century, however, building activity seems to have stopped virtually everywhere except Constantinople, Thessalonica, Corinth and Athens. This has traditionally been attributed to calamities such as plague, earthquakes and Slavic invasions. However, more recent analysis suggests that urban decline was closely linked with the collapse of long-distance and regional commercial networks that underpinned and supported late antique urbanism in Greece, as well as with the generalized withdrawal of imperial troops and administration from the Balkans. The scale of the Slavic incursions and settlement in the 7th and 8th centuries remains a matter of dispute, although it is nowadays considered much smaller than previously thought. The Slavs did occupy most of the peninsula, as evidenced by the abundance of Slavic toponyms, but these toponyms accumulated over centuries rather than as a result of an initial "flood" of Slavic invasions; and many appeared to have been mediated by speakers of Greek, or in mixed Slavic-Greek compounds. Fewer Slavic toponyms appear in the eastern coast, which remained in Byzantine hands and was included in the thema of Hellas, established by Justinian II c. 690. While traditional historiography has dated the arrival of Slavs to southern Greece to the late 6th century, according to Florin Curta there is no evidence for a Slavic presence in the Peloponnese until after c. 700 AD, when Slavs may have been allowed to settle in specific areas that had been depopulated. Relations between the Slavs and Greeks were probably peaceful apart from intermittent uprisings. There was also a continuity of the Peloponnesian Greek population. This is especially true in Mani and Tsakonia, where Slavic incursions were minimal, or non-existent. Being agriculturalists, the Slavs probably traded with the Greeks, who remained in the towns, while Greek villages continued to exist in the interior, probably governing themselves, possibly paying tribute to the Slavs. The first attempt by the Byzantine imperial government to re-assert its control over the independent Slavic tribes of the Peloponnese occurred in 783, with the logothete Staurakios' overland campaign from Constantinople into Greece and the Peloponnese, which according to Theophanes the Confessor made many prisoners and forced the Slavs to pay tribute. A map of Byzantine Greece ca. 900 AD, with the themes and major settlements. From the mid-9th century, following a Slavic revolt and attack on Patras, a determined Hellenization process was carried out. According to the Chronicle of Monemvasia, in 805 the Byzantine governor of Corinth went to war with the Slavs, exterminated them, and allowed the original inhabitants to claim their own lands. They regained control of the city of Patras and the region was re-settled with Greeks. Many Slavs were transported to Asia Minor, and many Asian, Sicilian and Calabrian Greeks were resettled in the Peloponnese. By the turn of the 9th century, the entire Peloponnese was formed into the new thema of Peloponnesos, with its capital at Corinth. The imposition of Byzantine rule over the Slavic enclaves may have largely been a process of Christianization and accommodating Slavic chieftains into the Imperial fold, as literary, epigraphic and sigillographic evidence testify to Slavic archontes participating in Imperial affairs. By the end of the 9th century, the Peloponnese was culturally and administratively Greek again, with the exception of a few small Slavic tribes in the mountains such as the Melingoi and Ezeritai. Although they were to remain relatively autonomous until Ottoman times, such tribes were the exception rather than the rule. Even the Melingoi and Ezeritai, however, could speak Greek and appear to have been Christian. The success of the Hellenization campaign also shows that the Slavs had settled among many Greeks, in contrast to areas further north in what is now Bulgaria and the former Yugoslavia, as those areas could not be Hellenized when they were recovered by the Byzantines in the early 11th century. A 2017 human genetics study showed that the Peloponnesians have little admixture with populations of the Slavic homeland and are much closer to Sicilians and southern Italians. Apart from the troubled relations with the Slavs, the coastal regions of the Peloponnese suffered greatly from repeated Arab raids following the Arab capture of Crete in the 820s and the establishment of a corsair emirate there. After the island was recovered by Byzantium in 961 however, the region entered a period of renewed prosperity, where agriculture, commerce and urban industry flourished. The Frankish castle of Clairmont (Chlemoutsi). The court of the Byzantine despots in Mystras, now a UNESCO World Heritage Site. In 1205, following the destruction of the Byzantine Empire by the forces of the Fourth Crusade, the Crusaders under William of Champlitte and Geoffrey of Villehardouin marched south through mainland Greece and conquered the Peloponnese against sporadic local Greek resistance. The Franks then founded the Principality of Achaea, nominally a vassal of the Latin Empire, while the Venetians occupied a number of strategically important ports around the coast such as Navarino and Coron, which they retained into the 15th century. The Franks popularized the name Morea for the peninsula, which first appears as the name of a small bishopric in Elis during the 10th century. Its etymology is disputed, but it is most commonly held to be derived from the mulberry tree (morea), whose leaves are similar in shape to the peninsula. Frankish supremacy in the peninsula however received a critical blow after the Battle of Pelagonia, when William II of Villehardouin was forced to cede the newly constructed fortress and palace at Mystras near ancient Sparta to a resurgent Byzantium. This Greek province (and later a semi-autonomous Despotate) staged a gradual reconquest, eventually conquering the Frankish principality by 1430. 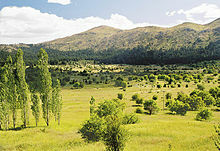 The same period was also marked by the migration and settlement of the Arvanites to Central Greece and the Peloponnese. The Ottoman Turks began raiding the Peloponnese from c. 1358, but their raids intensified only after 1387, when the energetic Evrenos Bey took control. Exploiting the quarrels between Byzantines and Franks, he plundered across the peninsula and forced both the Byzantine despots and the remaining Frankish rulers to acknowledge Ottoman suzerainty and pay tribute. This situation lasted until the Ottoman defeat at the Battle of Ankara in 1402, after which Ottoman power was for a time checked. Ottoman incursions into the Morea resumed under Turahan Bey after 1423. Despite the reconstruction of the Hexamilion wall at the Isthmus of Corinth, the Ottomans under Murad II breached it in 1446, forcing the Despots of the Morea to re-acknowledge Ottoman suzerainty, and again under Turahan in 1452 and 1456. Following the occupation of the Duchy of Athens in 1456, the Ottomans occupied a third of the Peloponnese in 1458, and Sultan Mehmed II extinguished the remnants of the Despotate in 1460. The last Byzantine stronghold, Salmeniko Castle, under its commander Graitzas Palaiologos, held out until July 1461. Only the Venetian fortresses of Modon, Coron, Navarino, Monemvasia, Argos and Nauplion escaped Ottoman control. The Venetian fortresses were conquered in a series of Ottoman–Venetian Wars: the first war, lasting from 1463 to 1479, saw much fighting in the Peloponnese, resulting in the loss of Argos, while Modon and Coron fell in 1500 during the second war. Coron and Patras were captured in a crusading expedition in 1532, led by the Genoese admiral Andrea Doria, but this provoked another war in which the last Venetian possessions on the Greek mainland were lost. The Venetian Lion of Saint Mark and halberds from the time of the Kingdom of the Morea in the National Historical Museum, Athens. "Commander Panagiotis Kephalas plants the flag of liberty upon the walls of Tripolizza", Siege of Tripolitsa, by Peter von Hess. Following the Ottoman conquest, the peninsula was made into a province (sanjak), with 109 ziamets and 342 timars. During the first period of Ottoman rule (1460–1687), the capital was first in Corinth (Turk. Gördes), later in Leontari (Londari), Mystras (Misistire) and finally in Nauplion (Tr. Anaboli). Sometime in the mid-17th century, the Morea became the centre of a separate eyalet, with Patras (Ballibadra) as its capital. Until the death of Suleiman the Magnificent in 1570, the Christian population (counted at some 42,000 families c. 1550) managed to retain some privileges and Islamization was slow, mostly among the Albanians or the estate owners who were integrated into the Ottoman feudal system. Although they quickly came to control most of the fertile lands, Muslims remained a distinct minority. Christian communities retained a large measure of self-government, but the entire Ottoman period was marked by a flight of the Christian population from the plains to the mountains. This occasioned the rise of the klephts, armed brigands and rebels, in the mountains, as well as the corresponding institution of the government-funded armatoloi to check the klephts' activities. With the outbreak of the "Great Turkish War" in 1683, the Venetians under Francesco Morosini occupied the entire peninsula by 1687, and received recognition by the Ottomans in the Treaty of Karlowitz (1699). The Venetians established their province as the "Kingdom of the Morea" (It. Regno di Morea), but their rule proved unpopular, and when the Ottomans invaded the peninsula in 1715, most local Greeks welcomed them. The Ottoman reconquest was easy and swift, and was recognized by Venice in the Treaty of Passarowitz in 1718. The Peloponnese now became the core of the Morea Eyalet, headed by the Mora valesi, who until 1780 was a pasha of the first rank (with three horsetails) and held the title of vizier. After 1780 and until the Greek War of Independence, the province was headed by a muhassil. The pasha of the Morea was aided by a number of subordinate officials, including a Christian translator (dragoman), who was the senior Christian official of the province. As during the first Ottoman period, the Morea was divided into 22 districts or beyliks. The capital was first at Nauplion, but after 1786 at Tripolitza (Tr. Trabliçe). The Moreot Christians rose against the Ottomans with Russian aid during the so-called "Orlov Revolt" of 1770, but it was swiftly and brutally suppressed. As a result, the total population decreased during this time, while the Muslim element in it increased. Nevertheless, through the privileges granted with the Treaty of Kuchuk-Kainarji, especially the right for the Christians to trade under the Russian flag, led to a considerable economic flowering of the local Greeks, which, coupled with the increased cultural contacts with Western Europe (Modern Greek Enlightenment) and the inspiring ideals of the French Revolution, laid the groundwork for the Greek War of Independence. The Battle of Navarino, on October 1827, marked the effective end of Ottoman rule in Greece. The Rio–Antirrio bridge, completed in 2004, links the western Peloponnese with mainland Greece. The Peloponnesians played a major role in the Greek War of Independence – the war actually began in the Peloponnese, when rebels took control of Kalamata on March 23, 1821. The Greek insurgents made rapid progress and the entire peninsula was under Greek control within a few months, with the exception of a few coastal forts and the main Turkish garrison at Tripolitsa. The fighting was fierce and marked by atrocities on both sides; eventually the entire Muslim population was either massacred or fled to the forts. The capture of Tripolitsa in September 1821 marked a turning point. Rivalries among the insurgents eventually erupted into civil war in 1824, which enabled the Ottoman Egyptian vassal Ibrahim Pasha to land in the peninsula in 1825. The Peloponnese peninsula was the scene of fierce fighting and extensive devastation following the arrival of Ibrahim's Egyptian troops. Partly as a result of the atrocities committed by Ibrahim, the UK, France and the Russian Empire decided to intervene in favor of the Greeks. The decisive naval Battle of Navarino was fought in 1827 off Pylos on the west coast of the Peloponnese, where a combined British, French and Russian fleet decisively defeated the Turko-Egyptian fleet. Subsequently a French expeditionary corps cleared the last Turko-Egyptian forces from the peninsula in 1828. The city of Nafplion, on the east coast of the peninsula, became the first capital of the independent Greek state. During the 19th and early 20th century, the region became relatively poor and economically isolated. A significant part of its population emigrated to the larger cities of Greece, especially Athens, and other countries such as the United States and Australia. It was badly affected by the Second World War and Greek Civil War, experiencing some of the worst atrocities committed in Greece during those conflicts. Living standards improved dramatically throughout Greece after the country's accession to the European Union in 1981. In late August 2007, large parts of Peloponnese suffered from wildfires, which caused severe damage in villages and forests and the death of 77 people. The impact of the fires to the environment and economy of the region are still unknown. It is thought to be the largest environmental disaster in modern Greek history. Several notable Peloponnese wines have Protected Designation of Origin (PDO) status. The Mantineia region makes a white wine made from Moschofilero, the Nemea wine region makes renowned red wines from the Agiorgitiko grape, and a fortified red wine is made in the region around the city of Patras from Mavrodafni grapes. ^ Planet, Lonely (10 May 2016). "Play in the Peloponnese: top 10 experiences". ^ Gregory, TE (2010), A History of Byzantium, Wiley-Blackwell, p. 169, It is now generally agreed that the people who lived in the Balkans after the Slavic "invasions" were probably for the most part the same as those who had lived there earlier, although the creation of new political groups and arrival of small immigrants caused people to look at themselves as distinct from their neighbors, including the Byzantines. ^ a b c Richard Clogg (20 June 2002). A Concise History of Greece. Cambridge University Press. pp. 35–42. ISBN 978-0-521-00479-4. Bées, N. A.; Savvides, A. (1993). "Mora". The encyclopaedia of Islam, v.7, MIF-NAZ: Prepared by a number of leading Orientalists ; ed. By C.E.Bosworth [et al.]. The Encyclopedia of Islam, New Edition, Volume VII: Mif–Naz. Leiden and New York: BRILL. pp. 236–241. ISBN 978-90-04-09419-2. Birken, Andreas (1976). Die Provinzen des Osmanischen Reiches. Beihefte zum Tübinger Atlas des Vorderen Orients (in German). 13. Reichert. ISBN 9783920153568. Fine, John Van Antwerp (1991). The Early Medieval Balkans: A Critical Survey from the Sixth to the Late Twelfth Century. University of Michigan Press. ISBN 978-0-472-08149-3. Obolensky, Dimitri (1971). The Byzantine Commonwealth: Eastern Europe, 500–1453. Praeger Publishers. Florin Curta (2011). The Edinburgh History of the Greeks, C. 500 to 1050: The Early Middle Ages. Edinburgh University Press. ISBN 9780748638093. Wikimedia Commons has media related to Peloponnese. Wikivoyage has a travel guide for Peloponnese. Greek Fire Survivors Mourn Amid Devastation in Peloponnese. Stewart, Daniel (2013). "Storing up Problems: Labour, Storage, and the Rural Peloponnese". Internet Archaeology (34). doi:10.11141/ia.34.4.